I recently was privileged to participate in the pilot run of a Borderlands Heritage Food Tour organized by Dr. Rafael de Grenade. It will eventually be part of a broader tourism attraction initiative. One of the first stops was the San Xavier Coop Farm where we saw their fields and also watched the preparation of the traditional cracked roasted corn product called ga’ivsa. 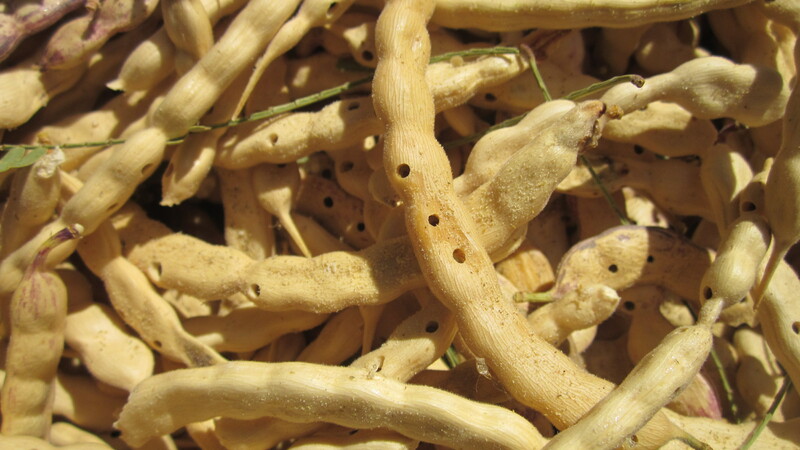 I had purchased some ga’ivsa from Ramona Farms on the Gila River Indian Reservation a few months before, but stuck it in the pantry and waited to learn more about preparation. Some women were processing the corn into ga’ivsa during our visit and we got a close-up look at their work. First the corn had to be shucked of all the outer leaves, then it is put on a charcoal fire to roast. 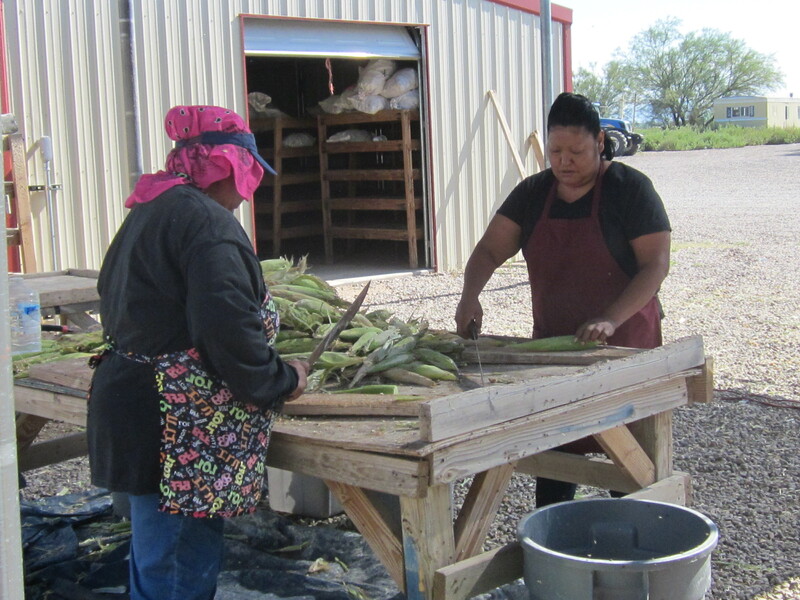 Tohono O’odham women work at shucking the fresh corn at San Xavier Coop Farm. Corn roasting over mesquite coals gets a delicious smoky flavor that adds to any dishes you prepare. 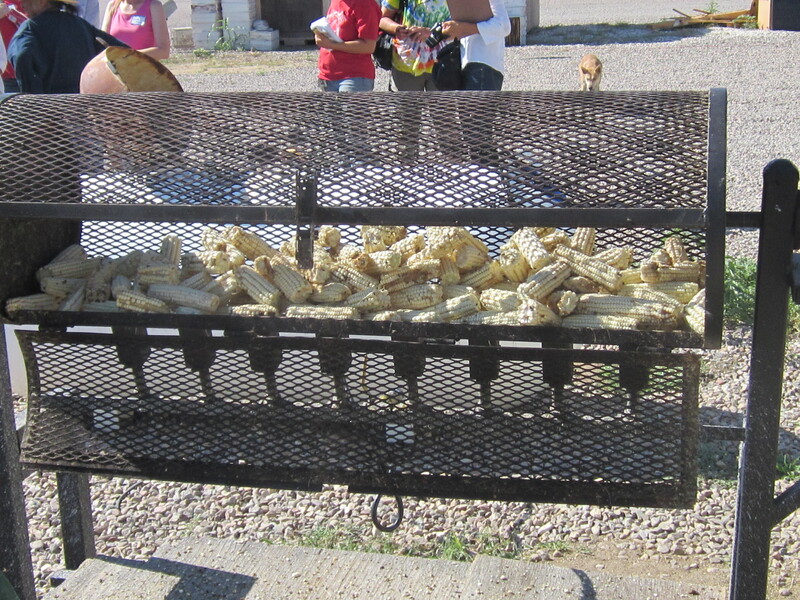 It was still very hot on that day, so we all moved into the shade of a barn where Verna Miguel, a Tohono O’odham woman from the San Xavier section of the reservation, explained to us that traditionally the corn was crushed manually. But now they have a machine that cuts processing time dramatically. You can see the machine behind Verna in the photo below. They can feed in the whole cobs that have been roasted and dried and get cracked corn ready for packaging. 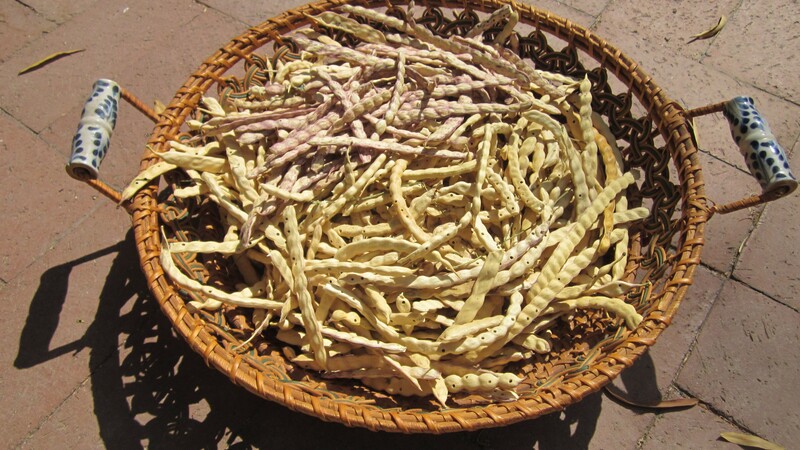 Verna Miguel discusses the products available from the San Xavier Cooperative Farm. Cracked corn processing machine in the background. Preparing the ga’ivsa begins with simmering it in water to soften it. Put it in a heavy bottom pot, cover with water and cook for about 30 minutes. Watch closely and add water as needed. The kernels will soften and swell. Soon it will begin smelling smoky, sort of like ham. A traditional preparation is corn soup. 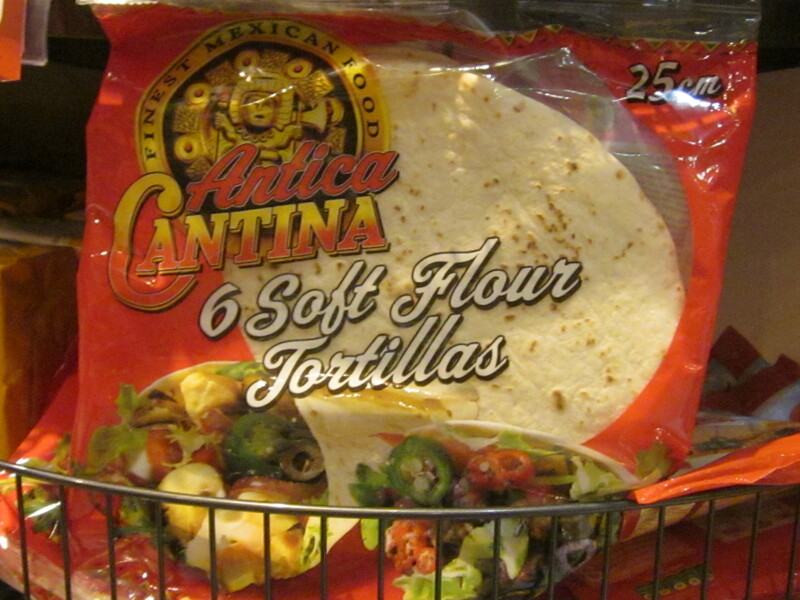 To add to the deliciousness, add some green chile and cheese and perhaps some chicken or vegetable base or bouillion. 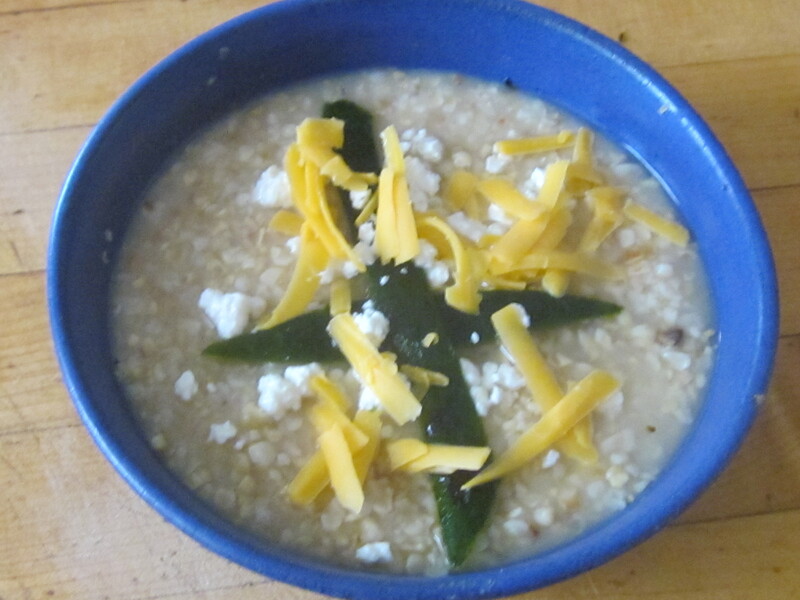 Ga’ivsa soup with green chile and cheese. With some cooked ga’ivsa left after the soup, I decided it would be great as a stuffing for a green chile. 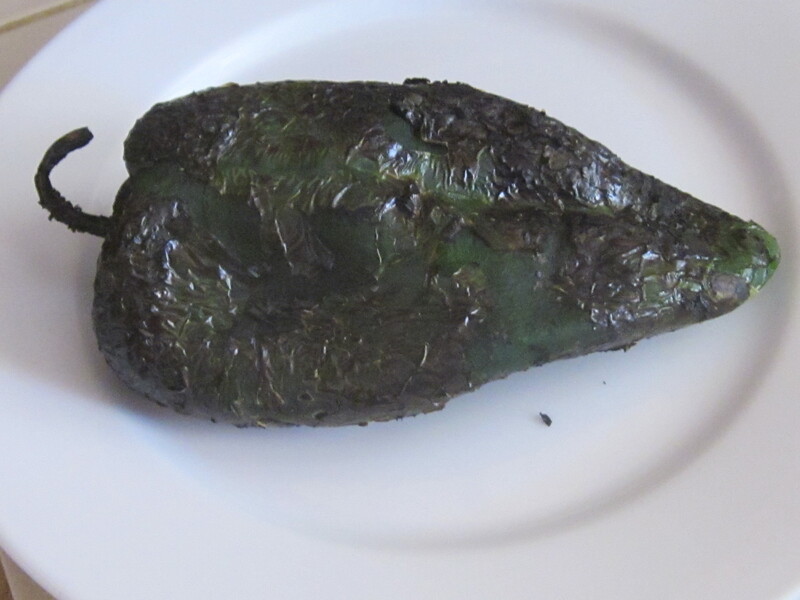 I roasted a poblano chile I had in my refrigerator, peeled it and cleaned out the seeds inside. 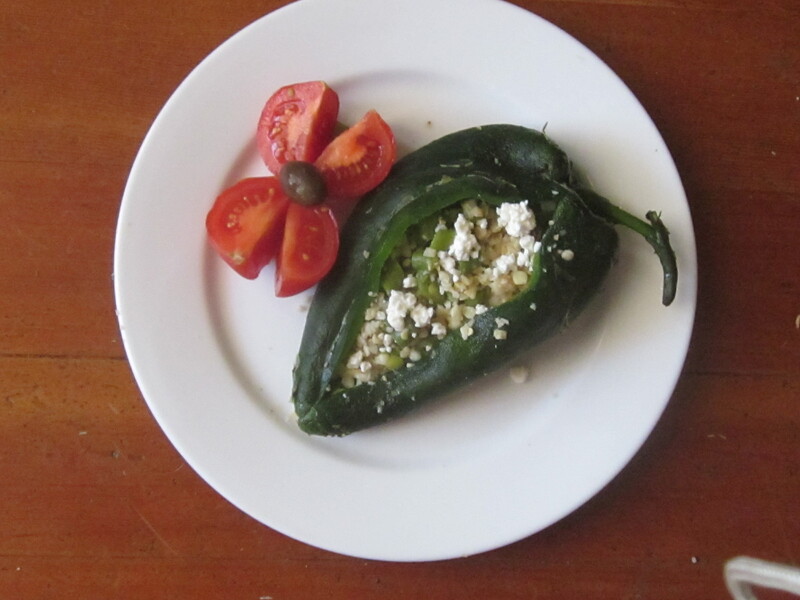 If you are new to roasting chiles, don’t be afraid to get the skin well charred so it will peel easily. Roasted poblano chile before peeling. I then sauteed some I’itoi onions (you could used green onions), and added those and some herbs to the cooked corn and stuffed it in the chile. I topped it with a little fresh cheese and heated it up. 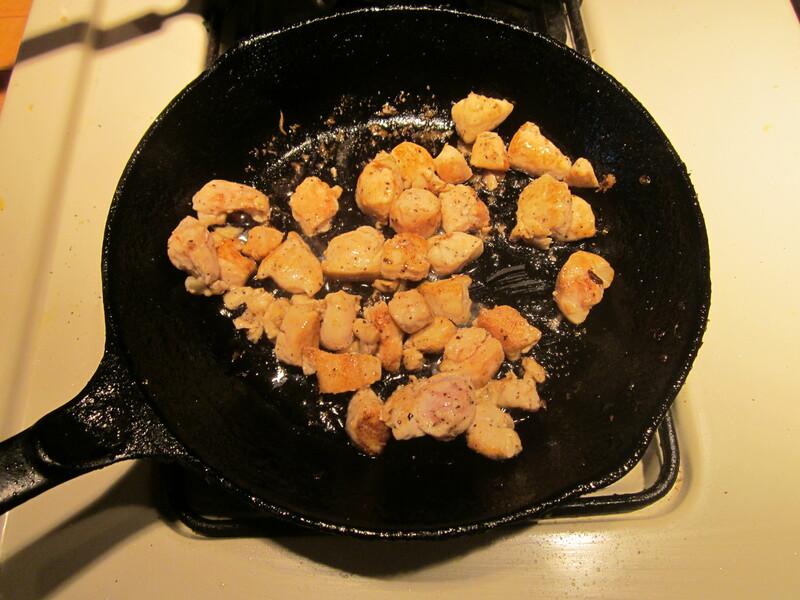 Some ground chicken or leftover meat of any kind could also work well. That became dinner. I should have taken a picture of my husband tucking in. He loved it. Chile stuffed with cracked corn mixture. 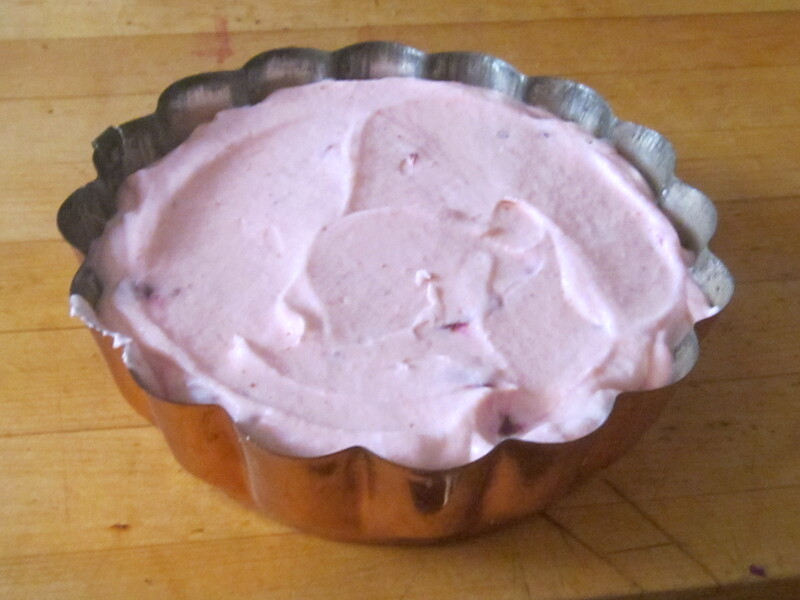 ‘Want more recipes for traditional foods and edible wild desert plants? 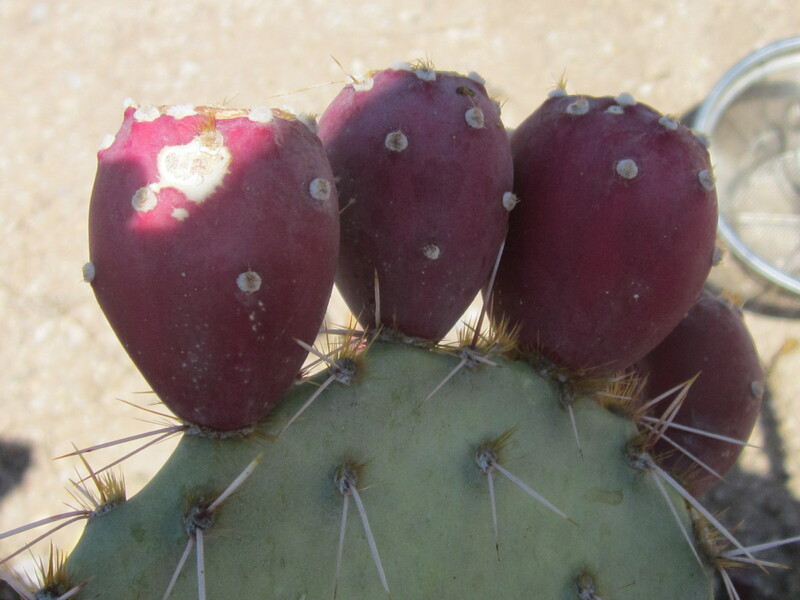 You’ll find lots of great ideas in The Prickly Pear Cookbook and Cooking the Wild Southwest. You’ll learn how professional chefs incorporate traditional Southwest ingredients into their menus in The New Southwest Cookbook. Ask your local bookstore to order for you or follow the links to order on-line. 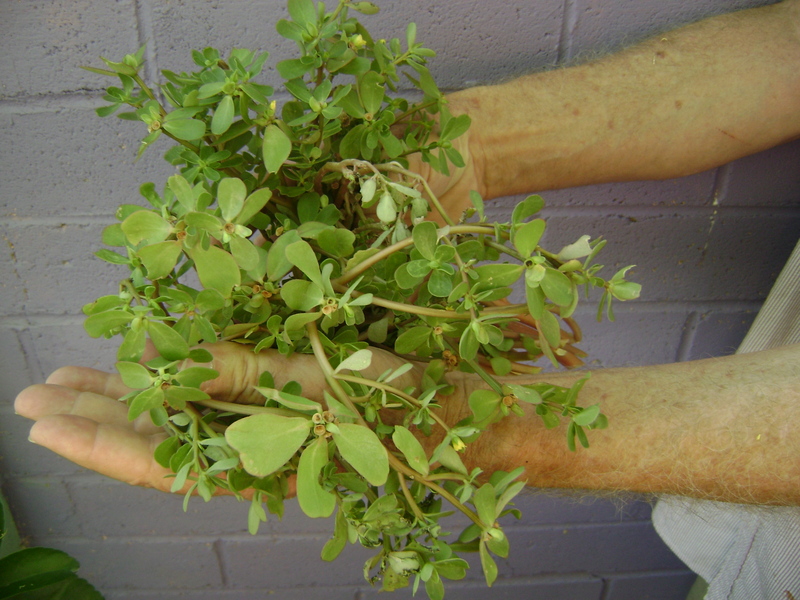 By this time in the Arizona monsoon season, flower gardens and other empty spaces should be full of juicy purslane, also called verdolagas. It has small fleshly leaves about the size of a fingernail, pinkish stems, and grows close to the ground. I have only a small patch this year next to an irrigation emitter because it simply has not rained yet in our part of downtown Tucson. The cactus are pitifully shrivelled and the ground is weedless. The picture above is from last year. Purslane can be eaten raw, chopped in salads or sautéed . In addition to all the vitamin C, calcium, and iron, purslane also has the most omega-3 fatty acids of any green. This is an important nutrient as our modern diets do not provide enough of it. Certain fibers also help in controlling blood sugar. Since it’s free and (usually) abundant, why not try some? 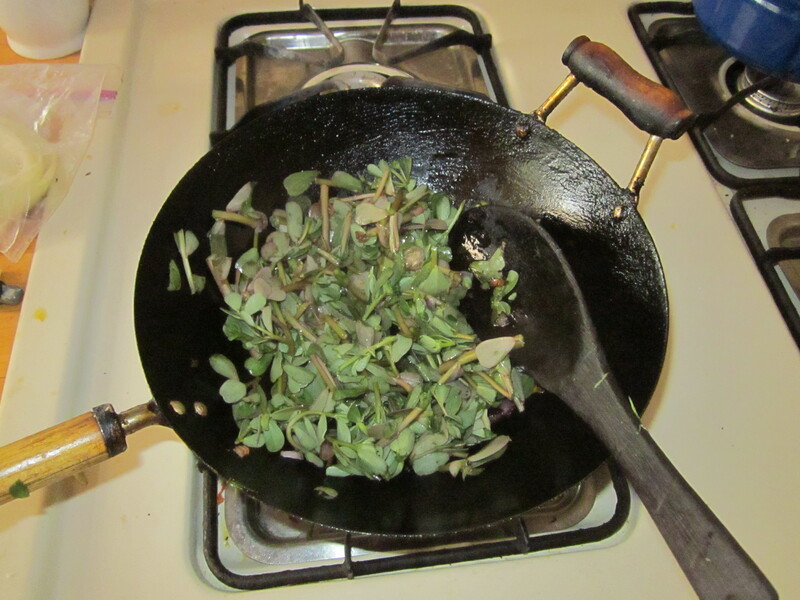 My friend Roni Rivera-Ashford taught me to put a bowl under the colander and catch the water you use to rinse the purslane. 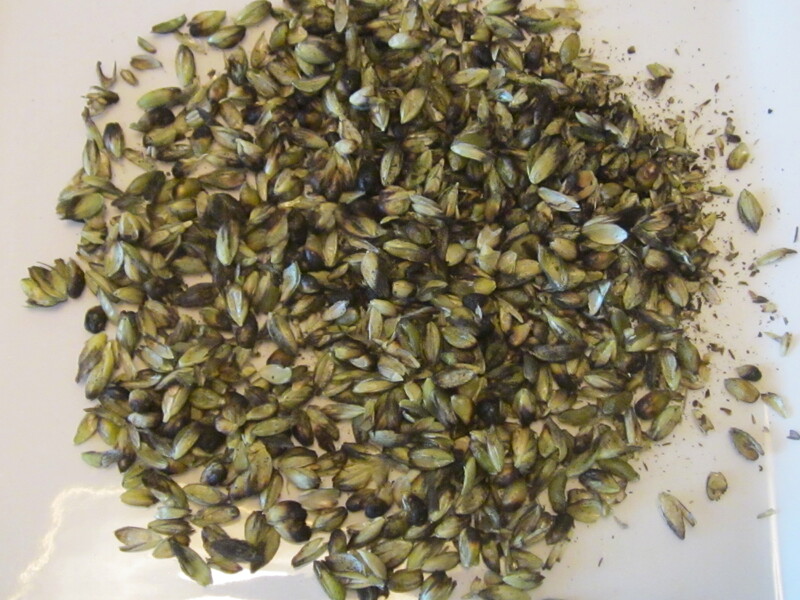 You will find lots of very tiny black seeds in the water. Pour that water with the seeds on a potted plant and you’ll have purslane next year. 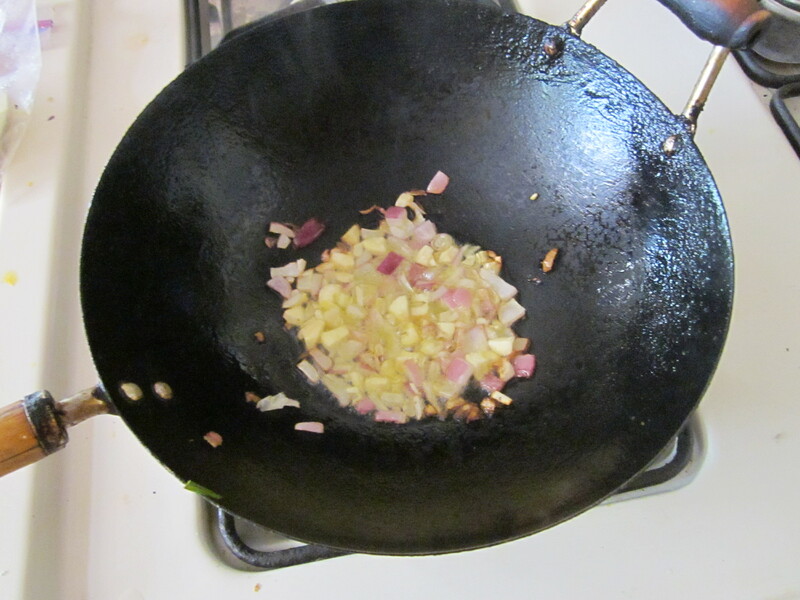 To prepare the purslane, first chop and sauté some onion and garlic in a little oil. I have I’Itoi onions left in my fridge from spring. Somehow they “know” it is time to be planted so they are beginning to sprout so I used some of those. Next add the chopped purslane. The classic next addition is chopped tomatoes. My advisor on Mexican food is my water aerobics buddy Elda Islas. She cooked for a houseful of sons when they were growing up and now delights grandchildren with her authentic Mexican food. She’s also pretty laid back. When I asked what else to add, she said, “Anything you want!” She added, “Sometimes I just clean out the refrigerator.” Taking her cue, I also added fresh corn and sautéed chicken pieces. … and chicken if you’d like. 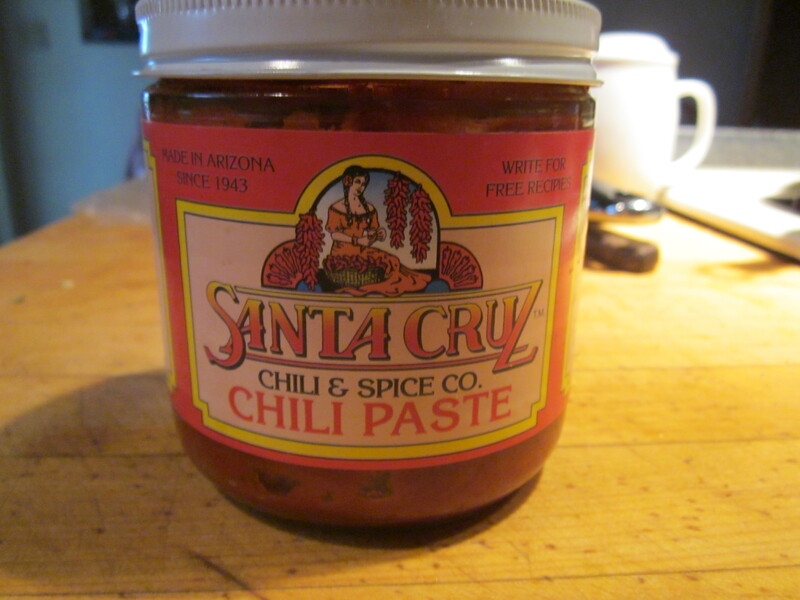 The mixture tasted a little bland to me, so I added a tablespoon of Santa Cruz Chili Paste. That is a staple in my refrigerator. 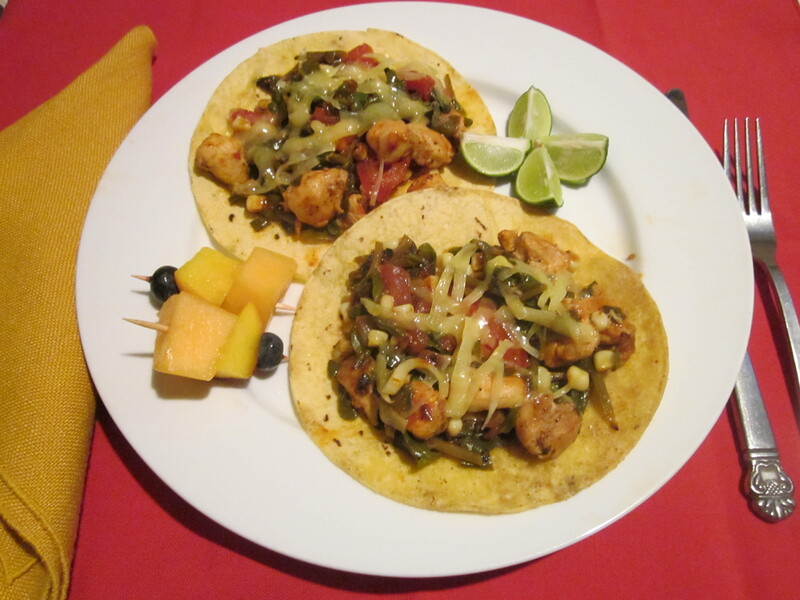 Elda’s suggestion for cheese topping is also forgiving: “Whatever you have.” I have some nice organic white cheddar so that is what you see on these purslane tacos. 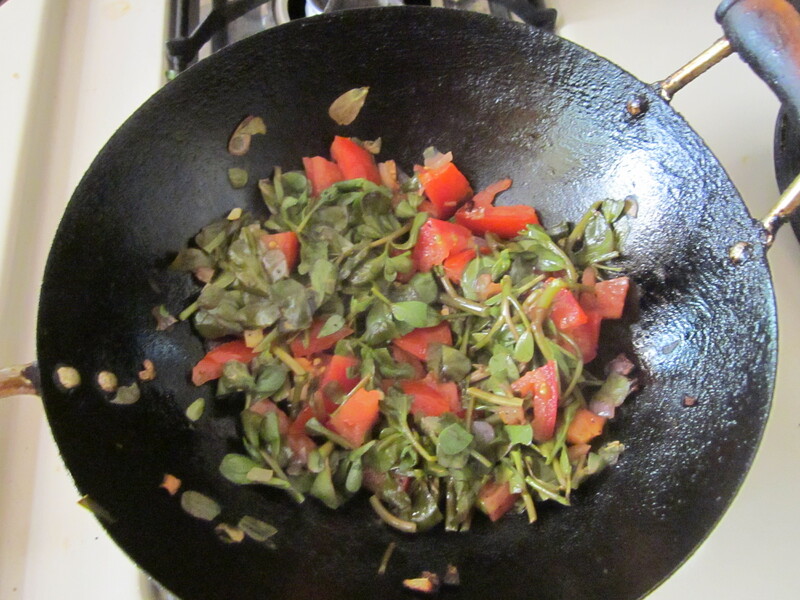 If you have a favorite way to use purslane, please share with the rest of us. 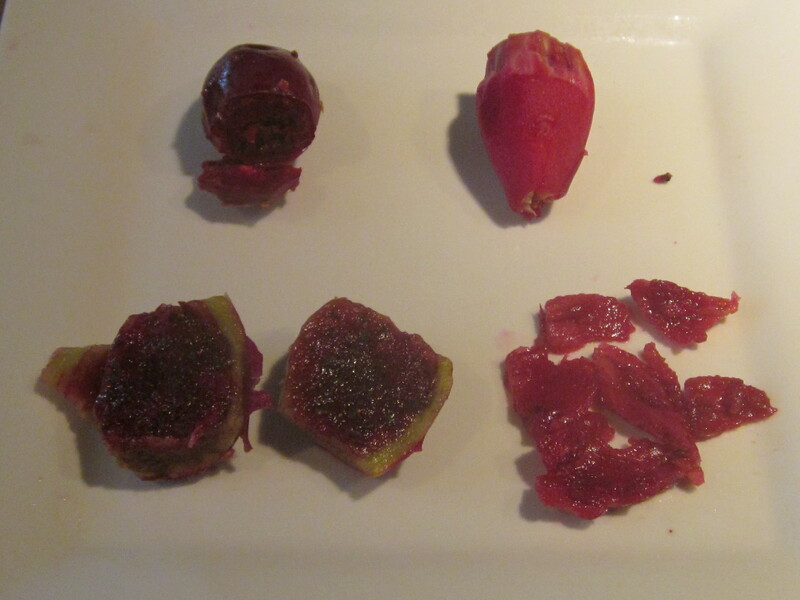 *I will be at the Second Annual Prickly Pear Festival in Superior this Saturday demonstratiing Prickly Pear Onion Jam. This event was rollicking last year and promises to be even better this year. 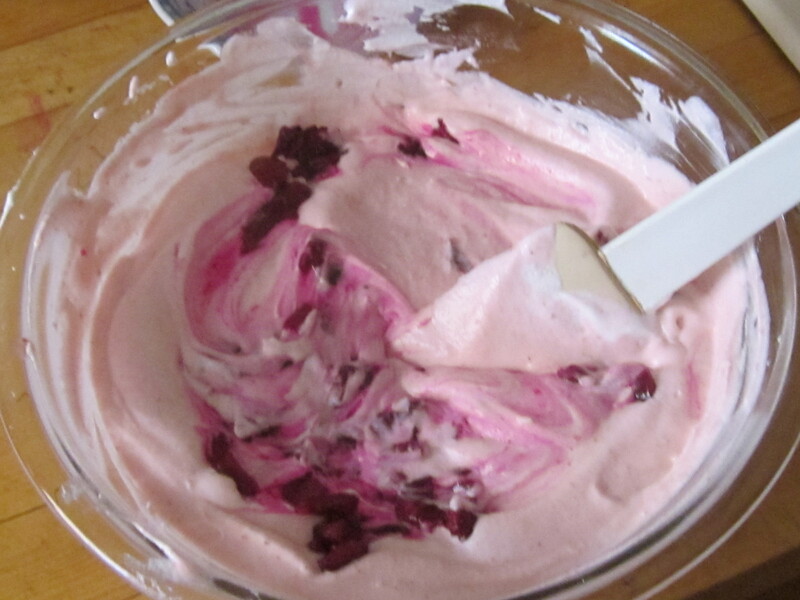 If you are interested in more recipes for desert plants, take a look at my books Cooking the Wild Southwest: Delicious Recipes for Desert Plants and The Prickly Pear Cookbook. The New Southwest Cookbook contains recipes from talented restaurant and resort chefs throughout the Southwest using traditional ingredients in new and delicious ways. On Saturday mornings in Prague, farmers and other food purveyors gather along the Vltava River to sell their wares. 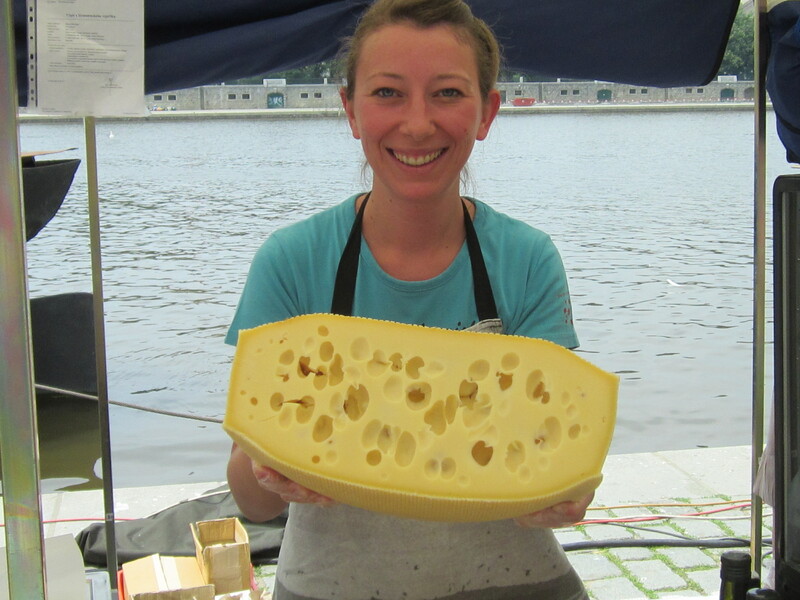 The woman above holds a cheese manufactured from organic milk in Moravia. There seemed to be an interest in the value of organic produce. 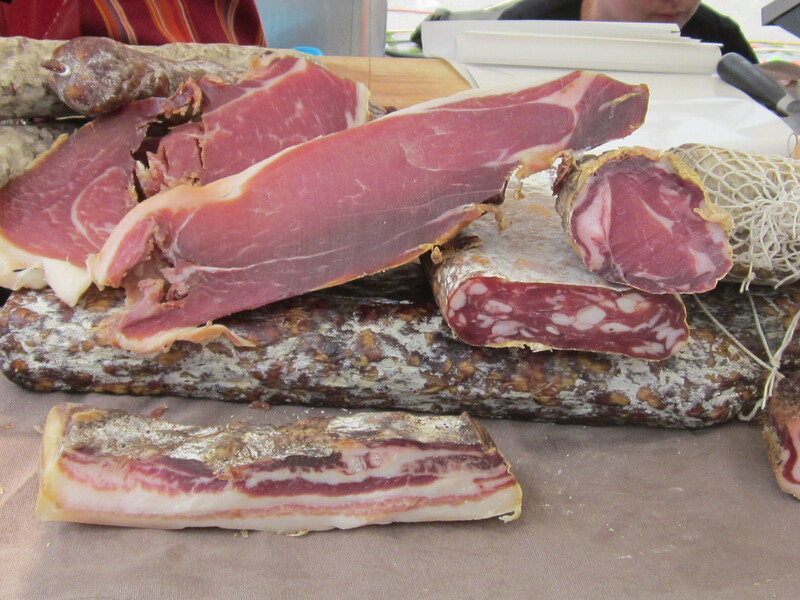 Along with the cheeses, were cured meats. We were always served a full selection of cold cuts for breakfast to layer on bread. 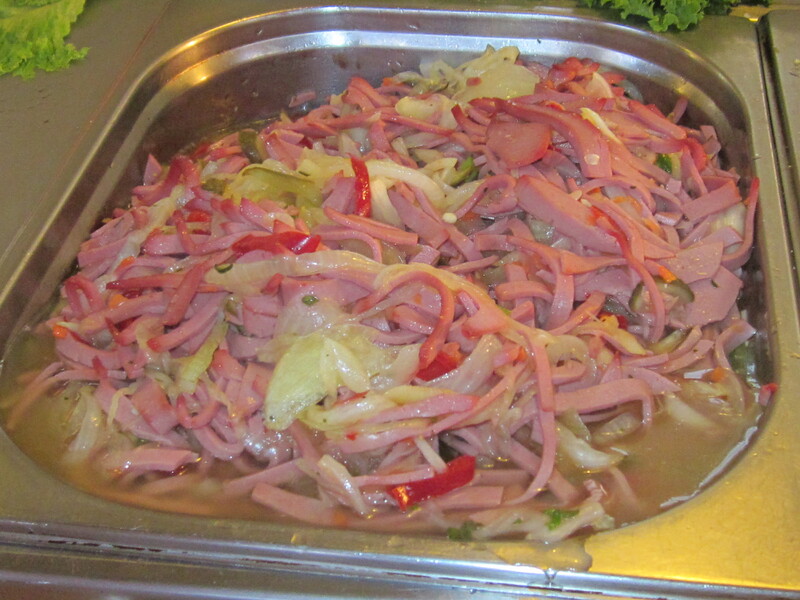 Cold cuts are also served for supper after the larger meal at noontime. 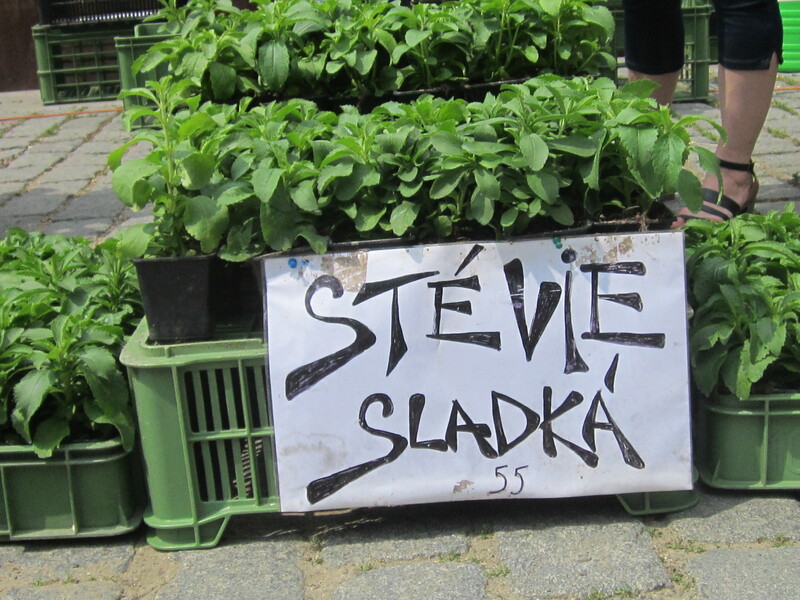 Stevia for people to take home and prepare their own sweetner. These fresh stevia plants were disappearing fast. I’m sorry that my inability to speak Czech hindered the possibility of finding out what the purchasers were actually doing with it once they got it home. 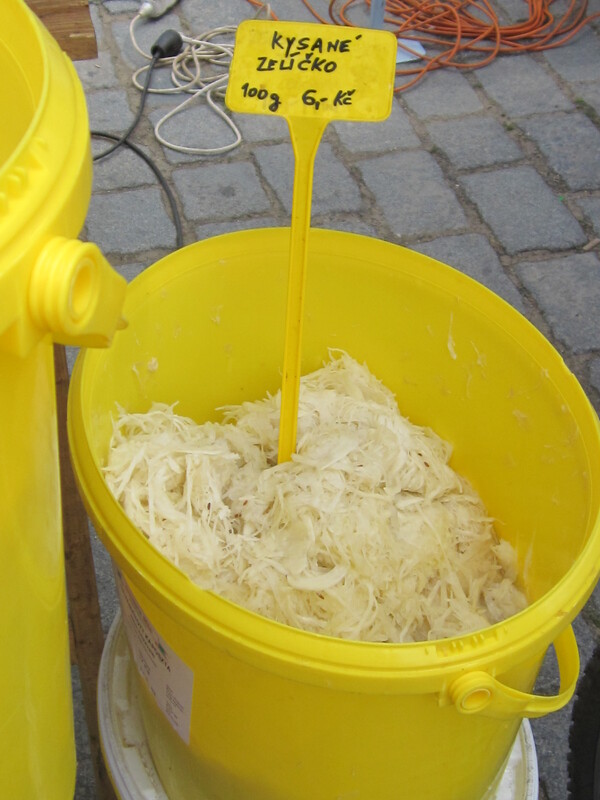 Pickled vegetables are big in the Czech Republic and this sauerkraut was sold from a bucket to take home by the pint. Fresh fruit syrups were the base for drinks. 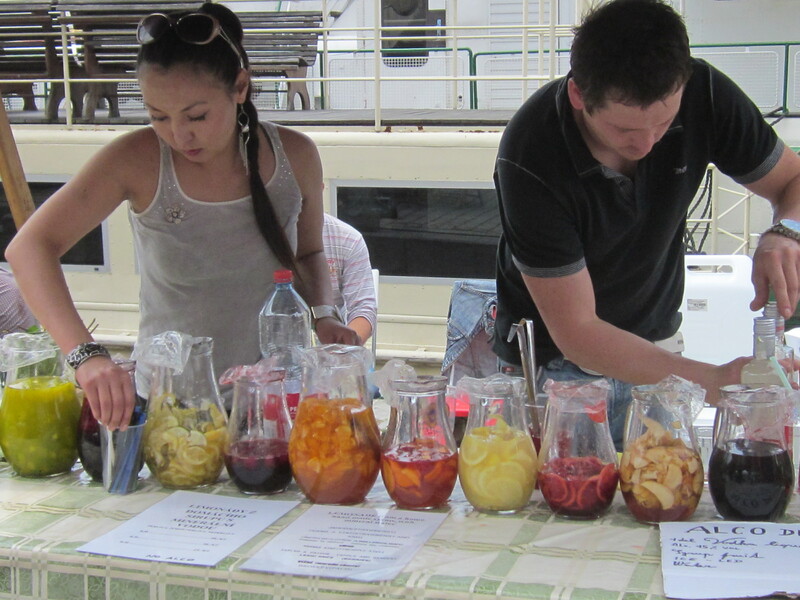 This young couple at the Prague farmers market had prepared nine different fresh fruit syrups such as kiwi, lemon, orange, and blackberry. You chose your flavor, they ladled some out and then filled the glass with carbonated water. Delicious and refreshing. It made the most fabulous lemonade I’ve ever tasted. 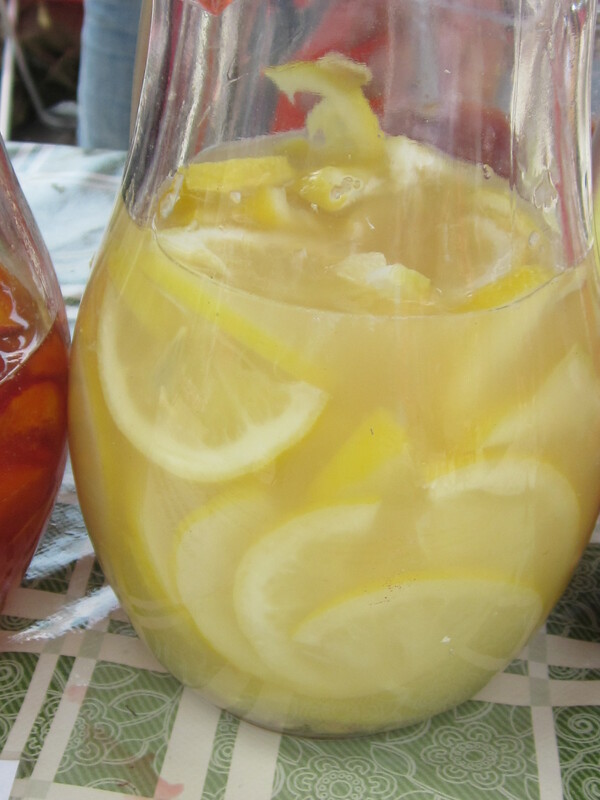 Here’s a close-up of the lemon infusion. 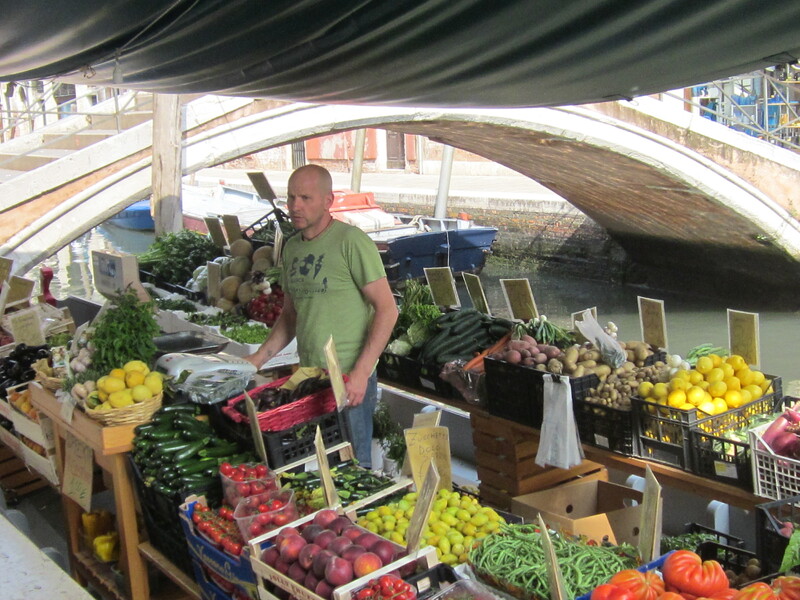 Vegetable market in a Venice canal. Summer means fresh vegetables throughout Central Europe. This merchant brought produce to our neighborhood on a boat moored in one of the Venice canals. Without access to a kitchen, I was limited to buying a few of those luscious peaches in the foreground. In Budapest we lived in an apartment with a well-equipped kitchen and it was really fun to shop at the market and try new things. 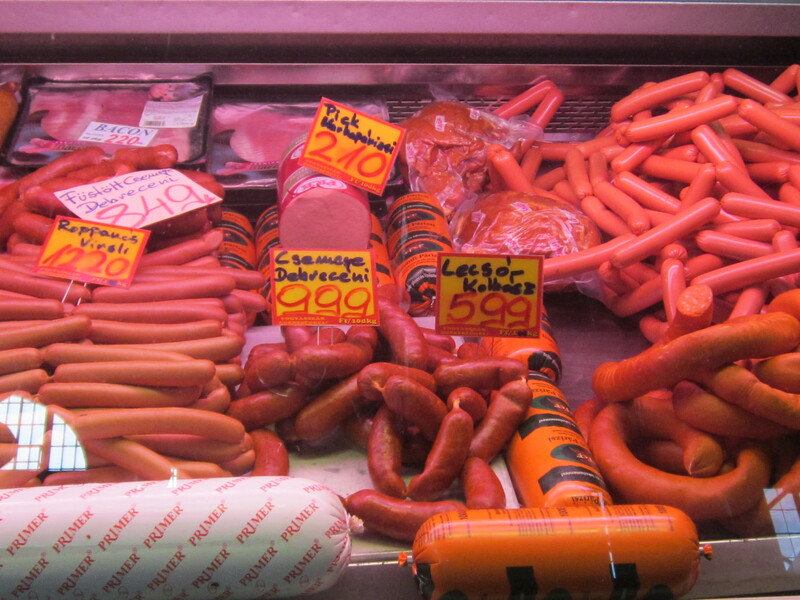 Central Europeans are really into sausages of all kinds. Here are just a few in the Central Market in Budapest. Those in the upper right corner look like standard franfurters to me but I didn’t buy any. Hungarians love sausages so much they even slice them up and make them into salad as above. 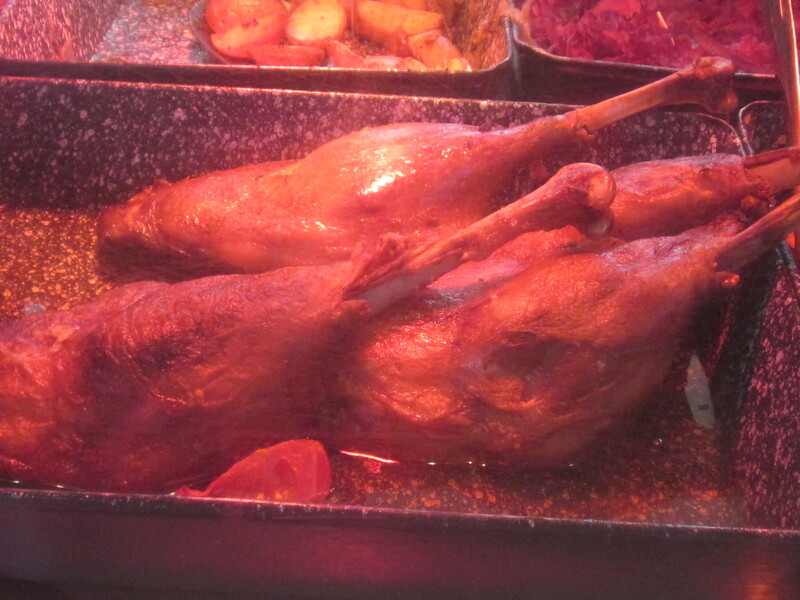 The first time we visited the Central Market in Budapest, my husband saw the roasted goose legs and just had to go back and try them. They were great. Goose liver paste is an important national delicacy, and I guess they really do need to come up with something to do with the rest of the goose. 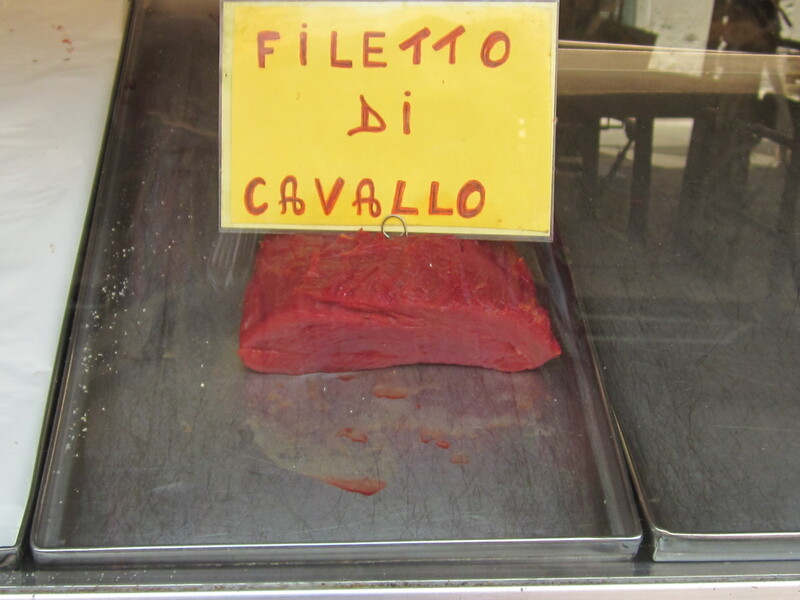 Saw the above in a butcher shop in Venice. There’s a different feeling about eating horses in Europe. That’s why we travel — to discover other ways of thinking and eating. But I must say the most unusual thing that I saw in the corner grocery where we shopped in Budapest was below. I was so shocked, I just took a picture and forgot to look at where they were manufactured. Right in our corner grocery in Budapest. Early morning wheat harvesting by hand at Ramona Farms. Heritage tomatoes with their odd shapes and color but superior flavor began appearing in mainstream markets about a decade ago. 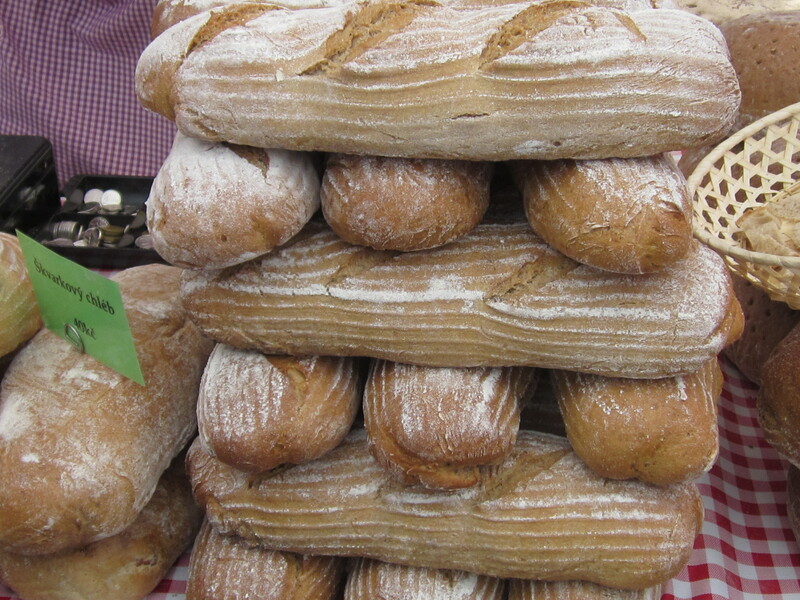 Now other heritage foods are becoming popular among them, wheat. Smithsonian Magazine ran an article on the rise of artisanal wheat that you can read here. 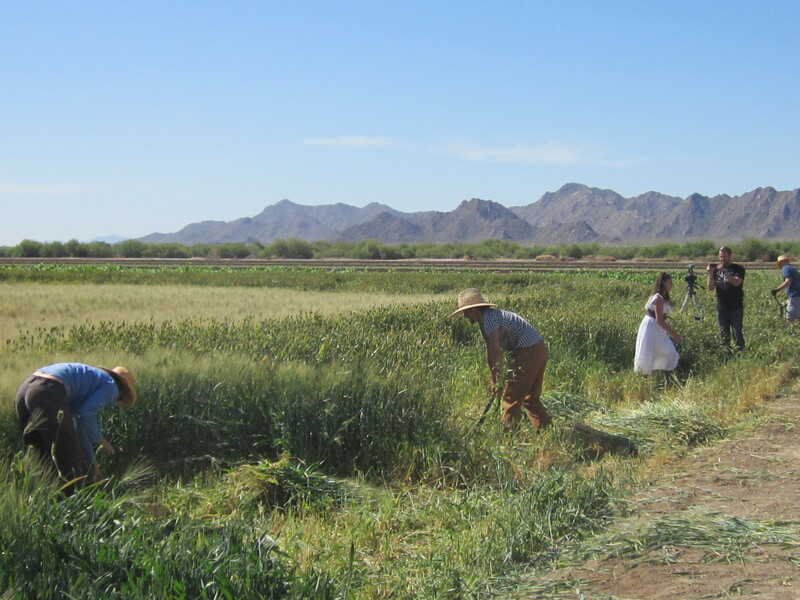 Last weekend I joined about a dozen others in harvesting two varieties of heritage wheat at Ramona Farms near Sacaton, just south of Phoenix. 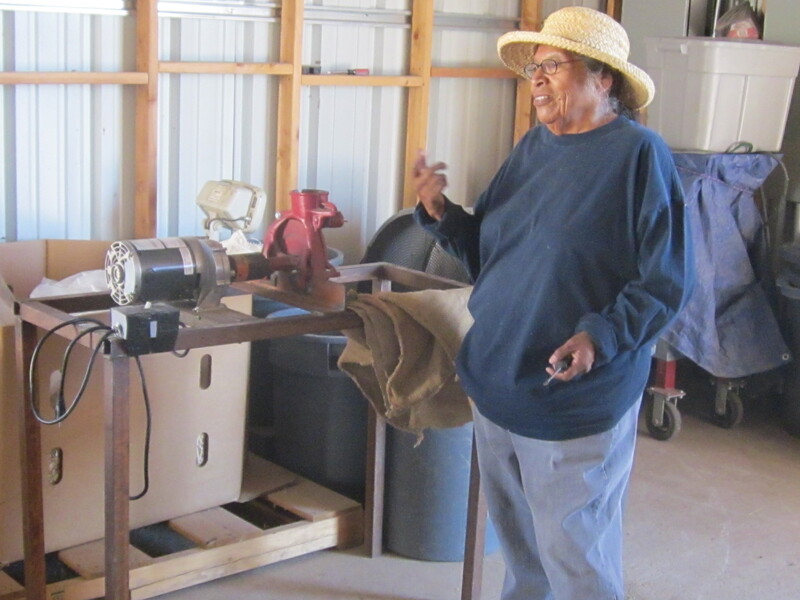 The farm is owned by Ramona Button, who is half Pima and half Tohono O’odham, and her husband Terry, who is all farmer. The wheat wasn’t ripe, but we wanted to get it at the green “milk” stage. 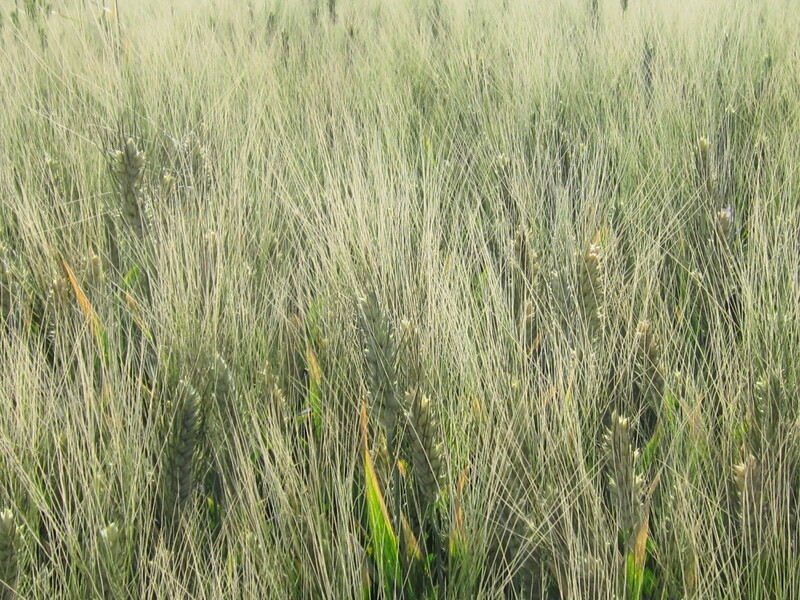 Durum wheat, prized by Italians for pasta. The beards (spikey parts) help with photosynthesis. Pima club wheat is low in gluten and makes good cookies and pastry. Wheat was brought to Sonora, Mexico, and eventually to Southern Arizona by Father Eusebio Kino and other Catholic missionaries in the sixteenth century. It was a hit with the local inhabitants because wheat grows through the winter and gave the Native Americans something to eat in the spring when they had used up their wild foods stored in the fall and were going hungry. 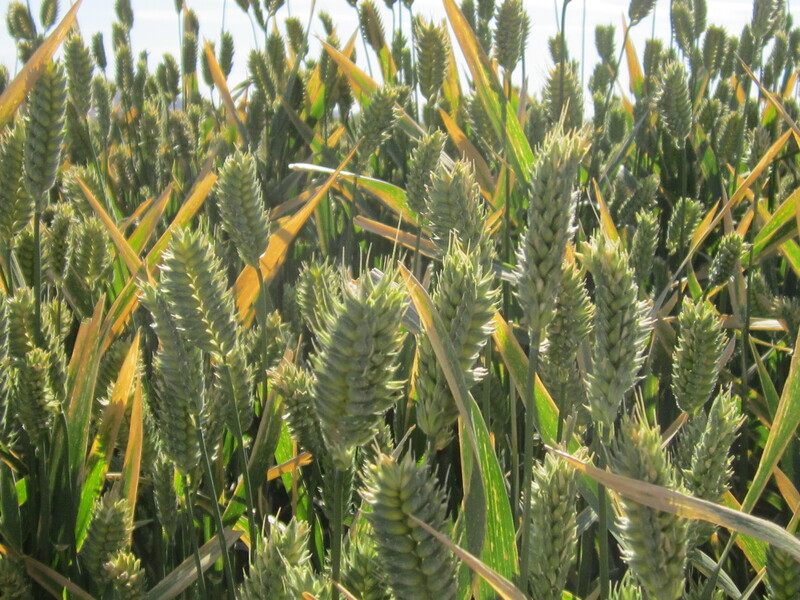 They didn’t wait for the wheat to all ripen, but began eating it as soon as the berries were plump. When they roasted the grain heads over a fire, the hulls blackened, but because the inside was moist, the grain itself just toasted. Then they rubbed off the black part and ate the delicious, smoky-flavored interior. 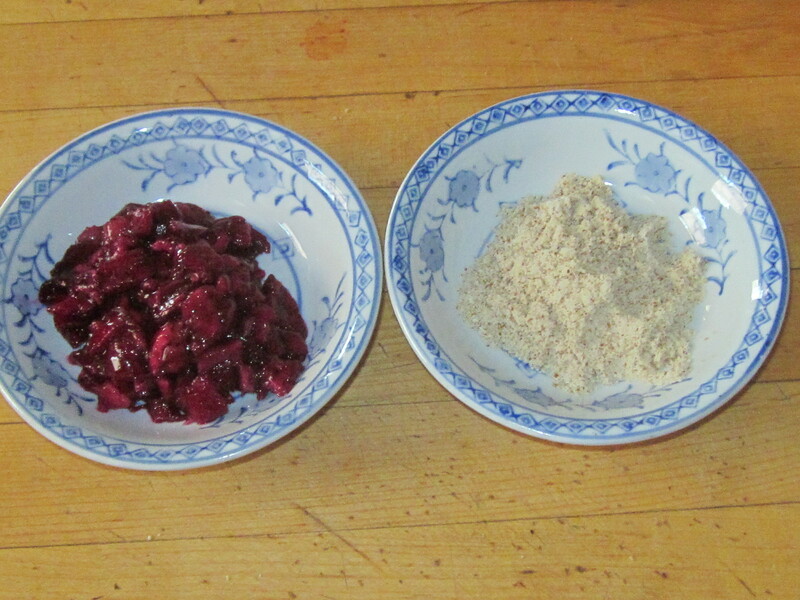 The name of this food was dagivin, which translates roughly “to prepare it by rubbing.” Middle Easterners also prepare wheat this way and call it freekeh. 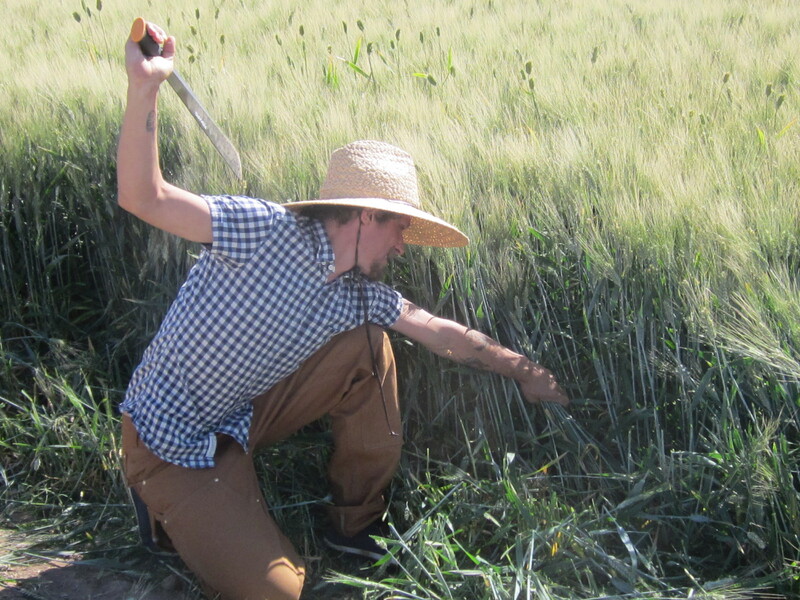 Jared McKinley of the forthcoming Edible Baja Arizona doing some hand hand harvesting with a machete. That’s Gary Nabhan behind all that wheat. Jeff Zimmerman, who runs Hayden Flour Mills in Phoenix, produces flour from heritage wheat grown in Arizona. 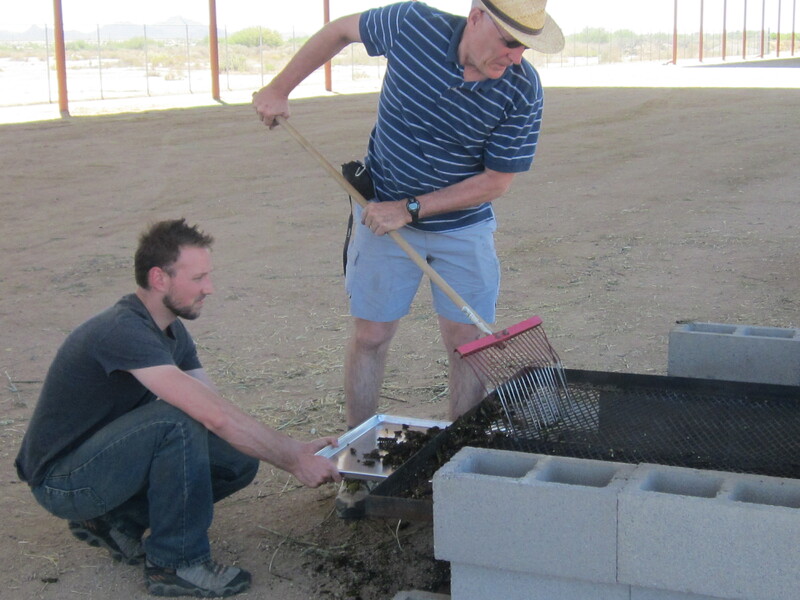 Here he and his son-in-law work on roasting the wheat over a fire. 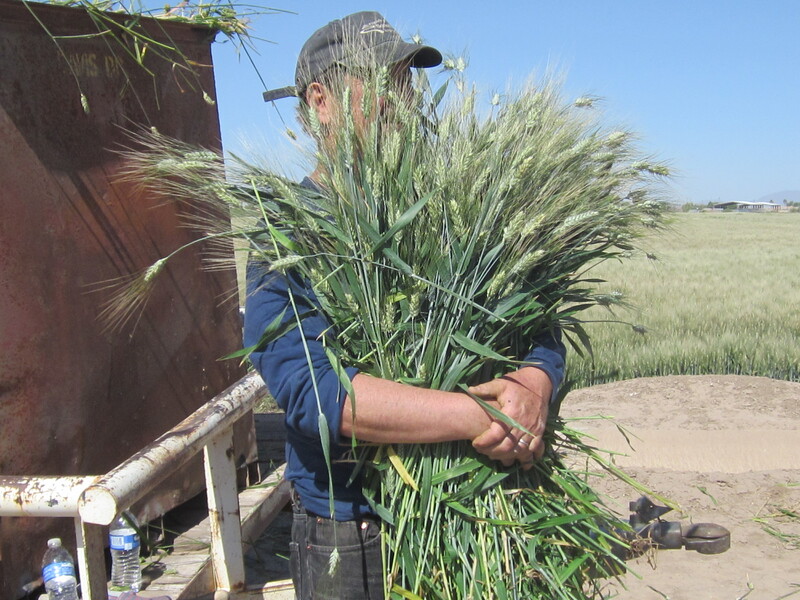 The story of how and why he began the business of stone-grinding heritage wheat in 2010 is fascinating and you can read it here from a story in the Arizona Republic. Raking out the toasted wheat. 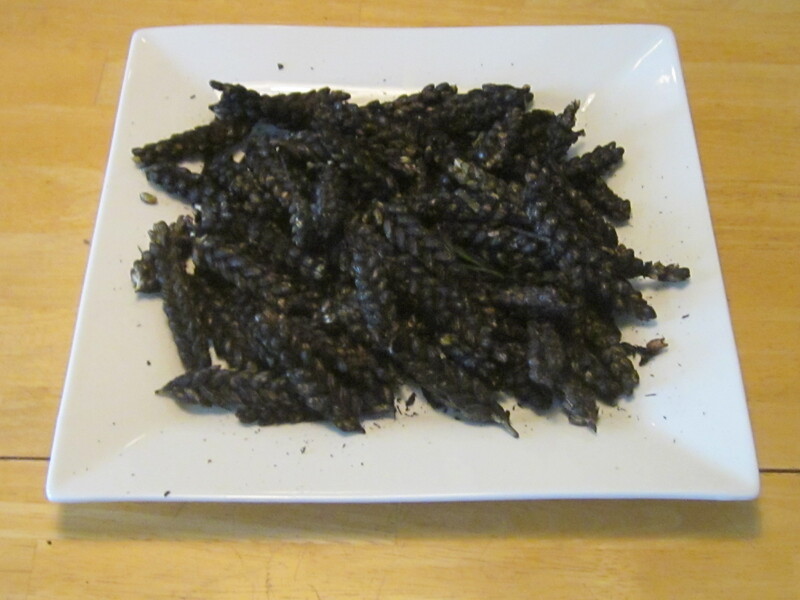 Roasted wheat berries with blackened hulls rubbed off. Nutritious, tasty, full of fiber and B vitamins, but probably not for the average American palate. 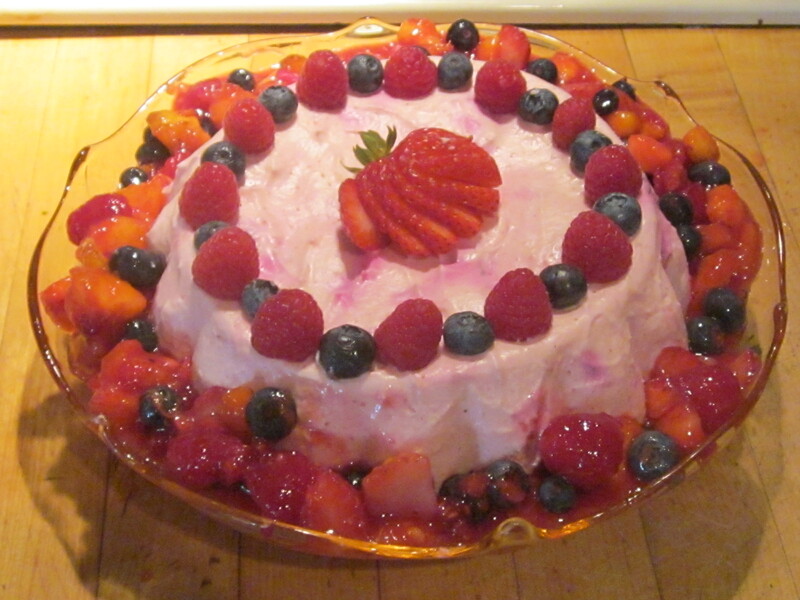 Interested in more heritage recipes? Check out my book Cooking the Wild Southwest for delicious recipes for 23 easily recognized and gathered southwest plants. Find out how top restaurant and resort chefs are using traditional Southwest foods in new and exciting ways in The New Southwest Cookbook. For a short video on some of the interesting plants you can gather, click here.